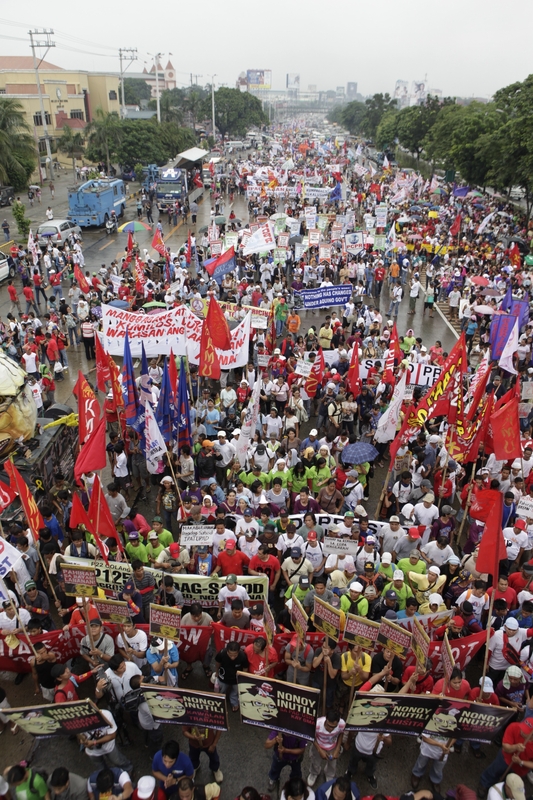 The July 25 SONA ng Bayan protests brought together some 10,000 more than 14, 000 people along Commonwealth Avenue, according to the reports obtained by Bayan from participating groups. The crowd was bigger than last year’s rally which numbered around 8,000. Police estimates for this year’s rally, as expected, was lower, at 6,500. Before the march got underway, we had to appear before the QC Regional Trial Court for a hearing on our petition on Bayan’s application for a rally permit. The case was quite simple. Bayan applied for a rally permit for Batasan Road on July 25, and the City Government had two days to act on the application otherwise it is deemed granted. Two days passed and there was no action from the City government. Three days before the rally, we received a letter from the Department of Public Order and Safety that our application was denied and we were being referred to the football field in the City Hall compound. The denial was, in our belief, violates BP 880 and recent Supreme Court rulings on the right to peaceably assemble. Our lawyers asserted that we had the right to march to Batasan Road but the city officials insisted that we would be causing traffic and that they had no time to make adjustments anymore. The judge appeared to mediate between the two parties. Without conceding our right to march to Batasan Road, we said that we would be amenable if the police barricade was moved back from the original position of St. Peter’s Church by up to 100 meters or so. The DPOS refused this compromise and said they would not budge from their established position. The hearing ended with no compromise reached. It was therefore to our great surprise that the judge denied our petition for a Temporary Restraining Order and cited that both sides had agreed to a compromise. The judge did not rule on the merits of the case and simply said that both parties had reached an agreement on where to hold the rally. Well, even without the TRO, the Bayan-led march was already able to march beyond St. Peter’s church. But the police were still there to block our path. It was the first time Bayan brought a case before a court and our lawyers are still discussing whether to appeal or not. In any case, having gone past the originally intended blockade, the Bayan forces settled and held the program. A sizeable international contingent joined the march, representing Bayan-USA, Intal-Beligum, and friends from Canada, New Zealand and Indonesia. The ILPS flag was carried by the international contingent. The speech was basically peppered with populist rhetoric which at this point has become tiresome and overused. The overarching theme was the ‘wang-wang’, which Aquino views as the symbol of abuse and entitlement. But beyond the “wang-wang” metaphor, there was really not much the people could get from the SONA. It was underwhelming in its litany of so-called achievements, and disturbing in its glaring omission of pressing people’s issues. The picture of the economy depicted by Aquino was very far from the reality experienced by ordinary Filipinos. The so-called increase in the stock market index or the improvements in the credit ratings are not things that translate to concrete benefits for the poor. These are mere indicators from the point of view of big business and the banks, and are not reflective of the state of the people. The fact that he chose to preface his SONA with stock indices and credit ratings shows what mindset Aquino has in terms of the economy. The more than 50-minute speech ended without any mention of how government will generate new jobs, increase wages, create housing for the poor, implement land reform or even assuage the impact of price increases. It is still the same ‘pantawid’ programs that will be implemented in the next five years. Aquino cited his accomplishment in terms of providing housing for police and soldiers but had nothing to offer for thousands of urban poor who are being displaced left and right in Metro Manila. Just two days before his SONA, two people were killed when residents and security guards clashed in a disputed area in Caloocan. The president’s claim of an improved employment conditions is being disputed by analysts, since the jobs created were offset by the new additions to the labor force, and the increase in underemployment. There is also the assertion that the new jobs created were either temporary employment in the area of construction or are the result in the increase in the number of self-employed, something which the government cannot take credit for. Aquino even made the outrageous claim that with the improved conditions, Filipinos can now choose between domestic and foreign jobs and not be tied to seeking work abroad. “Dati, nakapako sa pangingibang-bansa ang ambisyon ng mga Pilipino. Ngayon, may pagpipilian na siyang trabaho, at hangga’t tinatapatan niya ng sipag at determinasyon ang kanyang pangangarap, tiyak na maaabot niya ito,” Aquino said in his SONA. This claim has no basis in fact. More than a million Filipinos leave country each year to look for work abroad. Overseas deployment of Filipino workers in 2010 reached 1.47 million, still higher than the 2009 figure of 1.42 million. If there is a decrease in the growth rate of OFW deployment abroad, this is not because there are jobs being created here. The relative slowdown the deployment growth is the result of the global economic depression. Aquino never bothered to outline how new jobs will be created. He did not say which sectors of society will generate employment, and how these will happen. He talked of a “job-skills mismatch” as if this was the principal reason why unemployment is so high. Even if government “corrects” the so-called mismatch allegedly affecting 50,000 available jobs monthly, this will not offset the number of unemployed (considering additions to the labor force every year). What government needs to do is embark on a comprehensive program for genuine land reform and national industrialization to address the problems of poverty and unemployment. Government must strive to build a self-reliant economy. Relying on foreign investments for job creation will get us nowhere, as 30 years of experience will show. A self-reliant economy is even more urgent now that the US is on a brink of a debt default. We cannot continue to pin our hopes of progress on an economy that is grossly unstable and crisis-ridden. Aquino seemed to talk tough when it came to the issue of sovereignty, particularly the Spratlys dispute. However, Aquino was deafeningly silent on sovereignty issues in relation to the United States, particularly the US troops and the Visiting Forces Agreement. The tough-talk on Spartlys was obviously anchored on the US having expressed a willingness to intervene in the dispute to protect its own economic and politico-military interests. However, we’ve yet to see Mr. Aquino stand up for national sovereignty in relation to US violating our own sovereignty. Aquino also made a big deal about the Philippine Navy’s new acquisition, Hamilton Class Cutter from the US Coast Guard. “Literal na pong naglalakbay sa karagatan papunta rito ang kauna-unahan nating Hamilton Class Cutter, isang mas modernong barko na magagamit natin para mabantayan ang ating mga baybayin,”Aquino boasted. The boat Mr. Aquino was referring to is a Vietnam War-era boat commissioned in 1967 and decommissioned in March 2011 by the US Coast Guard. It is modern only in relation to the World War 2 era ships that our Navy still uses, but it is by no means modern, oh say in relation to uhm… China. Aquino did not say anything about our OFW’s who are keeping economy afloat. Perhaps there were really no achievements on this front, considering the debacles faced by the government in the repatriation and evacuation of Fiipinos in Libya, Japan and other places. Also, citing any other accomplishment will only make VP Binay look good. There were some bright spots in the speech, but these were few and far between. There was the certification of the Marcos victims compensation as an urgent bill. There was the appointment of a new Ombudsman. Human rights advocates were again sorely disappointed when there was no substantial response to the issue yet again. In fact, compared to his last SONA when he at least gave some updates on cases of extrajudicial killings, this year’s speech only had a fleeting, token, solitary mention of extrajudicial killings. Buo ang kumpiyansa ko na tinutupad ng Department of Justice ang malaki nilang bahagi upang maipiit ang mga salarin, lalo na sa mga kaso ukol sa tax evasion, drug trafficking, human trafficking, smuggling, graft and corruption, at extrajudicial killings. EJK’s were mentioned along with a whole bunch of issues that the DOJ has to address. The Commander-in-Chief of the AFP is leaving it to the DOJ to solve the problems of extrajudicial killings. It’s clear that the president is not really interested in taking on human rights issues such as the enforced disappearances of Jonas Burgos, Sherlyn Cadapan and Karen Empeno, or the plight of the more than 300 political prisoners still languishing in jail, or the rising numbers of victims of extrajudicial killings under his watch. It’s just irresponsible and insensitive and to pass all these issues to the DOJ, especially when the situation demands a strong response from the president. The AFP has not really cooperated and has consistently denied its involvement in gross human rights violations. Various rights groups have called on the president to intervene, but if the SONA is an indication, there’s none forthcoming. Last Wednesday, I found on my desk a mail from the Commission on Human Rights. It was a certified true copy of the CHR’s resolution on Melissa Roxas’ complaint of abduction and torture against the AFP. It’s been nearly two years since the incident happened. The resolution was dated February 14 but we only received the mail April 19. Roxas, a member of Habi-Arts and BAYAN’s United States chapter, was abducted in La Paz, Tarlac on May 19, 2009 along with John Edward Jandoc and Juanito Carabeo. She was held for several days and subjected to various forms of torture and forced to sign a document stating that she was a member of the New People’s Army. I was however aghast at what I read in the resolution. The CHR practically cleared the AFP in the abduction and torture. 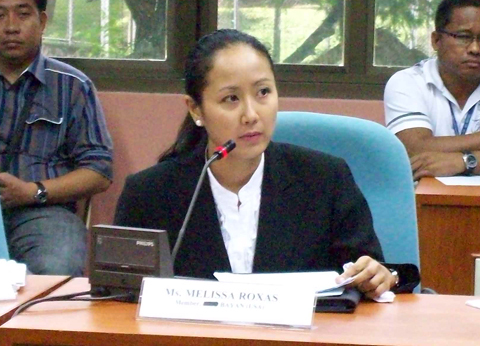 Worse, it said that the NPA may have been involved in the human rights violations against Melissa. In its findings, the CHR said that there is insufficient evidence to support the claim of torture because there was not enough evidence to determine the identities of the abductors. The CHR says torture includes “the elements of State party and agents”. So if you can’t prove soldiers did it, then it’s not torture, they say. “In the light of the lack of evidence against the persons who inflicted the physical and psychological maltreatment on the complainant, it is not possible for the Commission to reach any findings on torture, the definition of which includes elements of State party or agent and certain intentions, purposes and motivations,” the CHR resolution said. “There is, however enough evidence to find that complainant has suffered cruel, inhumane and degrading treatment or punishment by persons unknown,” the CHR added. So as far as the CHR is concerned, there are no conclusive findings that Melissa was tortured but it did say that she suffered cruel inhumane and degrading treatment. It also agreed that the injuries of Melissa were not self-inflicted and that her abduction was not “stage-managed” as some in the AFP claim. But alas, these findings are already known to the public and those familiar with the case. The real question now is who did it and what was the motive for the torture and abduction? “The CHR has received information that indicates the possibility that members of the NPA committed the kidnapping and other human rights violations on Roxas et al. These sources have been found to be credible (underscoring supplied). However, no specific names of individuals have been provided to the CHR, thus the Commission, with its limited resources, is unable to further follow up and identify specific persons as the possible perpetrators,” the report said. The report also said that “given the findings that present strong indication of involvement of the members of the New People’s Army as the perpetrators of the human rights violations against the complainant, there is a need to remind the parties of …the Comprehensive Agreement on Respect for Human Rights and International Humanitarian Law” which was signed by the Philippine government and the National Democratic Front of the Philippines. These statements are simply gratuitous, illogical and unsubstantiated. How can the CHR give credibility to sources pointing to the NPA’s involvement yet offer no evidence, detail, let alone motive for Melissa’s alleged abduction by the NPA? The CHR practically clears the AFP by leading the public to believe the NPA may have abducted Melissa, without even presenting a shred of evidence and with total disregard for the detailed testimony of the victim. The “NPA abduction theory” is quite incredulous if you review Melissa’s affidavit executed just days after her release from detention. The line of questioning by Melissa’s captors during her detention and torture make it illogical to pin the blame on the NPA. The line of questioning was consistent with that of the military when they interrogate leftist activists suspected of being members of the NPA. In her own account of her detention, Melissa was forced to sign a document saying she was a member of the NPA and was repeatedly asked to return to the fold of the law. She was asked how she got involved in Bayan USA and was lectured on anti-communism and religion as the CHR report admits. She was also told she was on the “order of battle”. She was only released when she played along with her captors’ demand that she will reform and end her involvement in the movement. With these details, how can the CHR even consider and give weight to the unsubstantiated claims that Melissa was abducted and tortured by the NPA? It defies logic. What motive does the NPA have to abduct her and force her to admit she’s a member of the NPA? Why would the NPA torture her to make her return to the fold of the law? It simply doesn’t make sense. Unless the CHR thinks Melissa is not telling the truth in her affidavit. But what motive does Melissa have for making up stories? In her testimony, Roxas said that while in detention, she got a glimpse of a man wearing fatigue uniform, heard gunfire as if in a firing range, and heard the sound of aircraft as if near an airport or landing strip. She also said she was confined in a facility that appeared to be a barracks that had iron bars. She also said that she was moved from buildings in a compound. Aren’t these facilities NPA facilities or AFP facilities? Unless the CHR thinks the NPA now has airstrips and firing ranges, the reasonable thing to do is to probe deeper into the involvement o the AFP. The CHR reso makes a big deal about so-called non-state actors involved in Melissa’s abduction yet offers not a single piece of evidence to back this up. It should have pursued leads as to the AFP’s involvement instead of washing its hands and saying it does not have manpower or resources to investigate. The CHR said it did not have enough time to inspect the entirety of Fort Magsaysay and that their visits were rarely unhampered by the military. It also said that the victim’s visit to the place to recall her detention was “inconclusive”. If this was the case, why rule out the possibility that Melissa was indeed taken to Fort Magsaysay? Why not complete the investigaation of the site? One of the interesting revelations from the probe initiated by former CHR chair Leila de Lima was the source of a book given to Melissa by her captors. The book’s serial number or barcode was traced to a National Bookstore outlet in Cabanatuan, Nueva Ecija. It was purchased during Melissa’s detention. Fort Magsaysay is also in Nueva Ecija. Mere coincidence? Not likely. The AFP’s alibi that human rights violations against leftists were the handiwork of the NPA has already been discredited years ago. The line that the NPA did the human rights violations against leftist activists has long been discredited. It was rejected by the Melo Commission and by the UN special rapporteur on extrajudicial killings Philip Alston. It is a surprise that the CHR again resurrects this worn out and discredited line. It’s an injustice to Melissa and other victims of torture who are unable to identify their torturers hidden in the shadows. After practically clearing the AFP of liability, the CHR also “reminded” the Philippine government and the NDFP of their responsibility under the CAHRIHL. The CHR report on Melissa’s case is a far cry from an earlier report on Jonas Burgos wherein a member of the AFP was identified as one of the perpetrators. Why the CHR came up with this sloppy, unsubtantiated and illogical report, we can only speculate. I personally don’t think that was the direction and outcome of the investigation initiated by the former CHR chair. Her insights on the resolution would probably be sought out by the media as well. We can understand if the CHR lacks manpower and resources to conduct a thorough probe. Add to this the refusal of the AFP to even cooperate with any investigation related to human rights. What we do not understand, and cannot accept, is the CHR practically absolving the AFP and pointing the blame somewhere else, when clearly it should not be the case. So what happens now? The CHR has passed on the responsibility of probing the case to the PNP and NBI since they supposedly have the mandate and resources. Such were the words of political prisoner and cultural worker Ericson Acosta as we concluded the “Prison Sessions”recording at the Calbayog sub-provincial jail last April 6. Acosta, who was arrested without warrant last February 13, faces false charges of illegal possession of explosives and remains incarcerated at the Calbayog jail. Ericson wasn’t exaggerating when he said that the songs we recorded that day, songs that spanned the entire 17 years that I have known him, were somehow to blame for his current situation. I met Ericson in 1994, during a period of transition in the Philippine Collegian. Our meeting was not really of a political sort. We just happened to be at the 4th floor of Vinzons Hall, where the Center for Nationalist Studies library and the Collegian office were located and where the rehearsals for Alay Sining’s PD1081 were being held. It was during those times that we happened to have a similar interest in music, along with the Kule editor-in-chief Mike Ac-ac who played the blues harp. Our “set list” consisted of Binky Lampano, The Doors, U2, The Jerks, Eraserheads, Yano and so on. The stage was the 4th floor lobby of Vinzons, or the Grandstand in Sunken Garden. We eventually brought our “performances” to protest actions against the commercialization of UP, with megaphones as our sound system. Ericson got to know the activists of ND movement, both in and out of Kule. 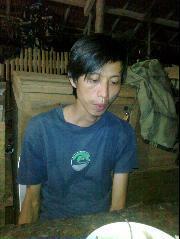 He would eventually join and lead Alay Sining. He went on to write and perform songs that he composed. Ericson wrote epic loves songs that inspired revolutionary romanticism among listeners. His songs found an outlet through the multi-media production called Monumento, about the life of Andres Bonifacio and the unfinished revolution. He wrote and directed the production and was also the lead actor. One of his early compositions, “Awit ng Kasaysayan” was the opening song. Ericson’s songs however, are not just meant to inspire or consolidate the ranks of the activist youth. The songs are often a reflection of his own personal contradictions as artist and activist. The songs exhort the artist to follow the road less traveled and to immerse themselves in the revolutionary struggle of the people. The second stanza of the song “Dahil” tells us why. The song “Haranang Bayan” may have referred to Ericson being a “late bloomer” as far as activism was concerned. Learning to playing music, even belatedly, became a metaphor for joining the struggle. It is never too late to be part of this grand “composition”. Again the familiar theme reminds the audience of the artist’s ultimate goal. The same is true in Ericson’s poem, “And so your poetry must”, a scathing criticism of poets and artists who deny social realities. the empty bowl of history. The love song “Magsasama, Magkasama” has a more upbeat tune and theme, with the artist and revolutionary having accepted his/her role. And so from this pledge (panata) to serve the people, Ericson went outside the university and experienced firsthand the struggles of the oppressed masses. Fulfilling his pledge meant going to picket lines, far-flung barrios and depressed communities. Developing his craft meant making art serve the people struggle. 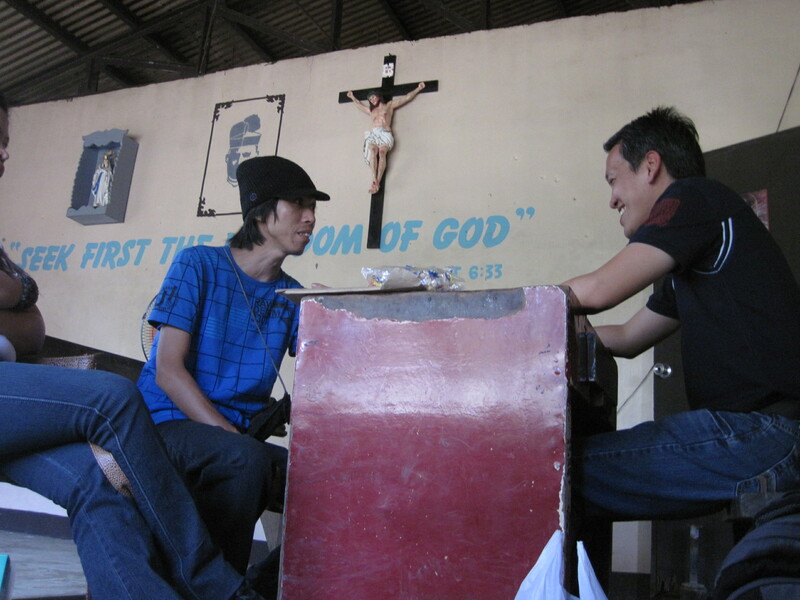 At the time of his arrest, Ericson was investigating the human rights situation in Ban-yang, San Jorge,Samar. 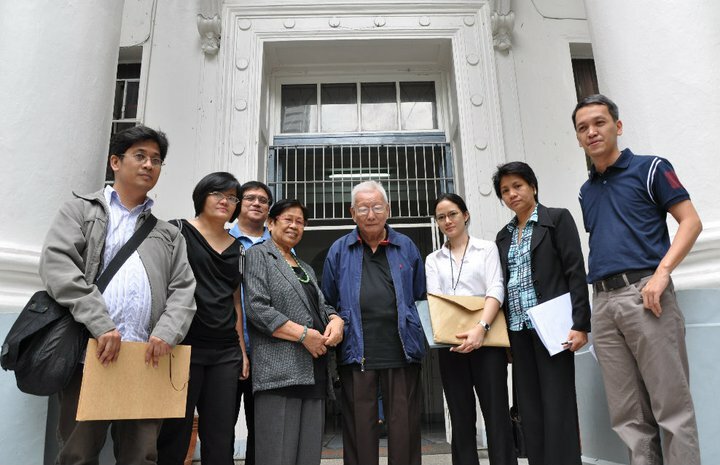 Prior to this, he had written articles on human rights violations against farmers in Samar. His only “crime” at the time of his arrest was that he was a Tagalog-speaking person with a laptop in a remote village. His affidavit tells of the strange circumstances of his illegal arrest and how, because he seemed a bit out of place in that barrio setting, he was accused of being an NPA. One can’t help but recall how, similarly during Martial Law, those with long hair were arrested on suspicion they were activists. It seems that in some places in the country, people are still living in that era. “Dati sa Vinzons lang tayo kumakanta,” I told him at the start of the recording. From Vinzons Hall to the Calbyog jail multi-purpose hall, from the first mounting of Monumento, to the raw recordings inside prison, Ericson has come a long way. His current situation may not be something he had contemplated in any of his songs, but rather an unexpected consequence of the choices he had made as an artist and activist. And they were the right choices, notwithstanding the sacrifices he currently has to endure. If anything, his experience further highlights the continuing gross human rights violations under the current regime. 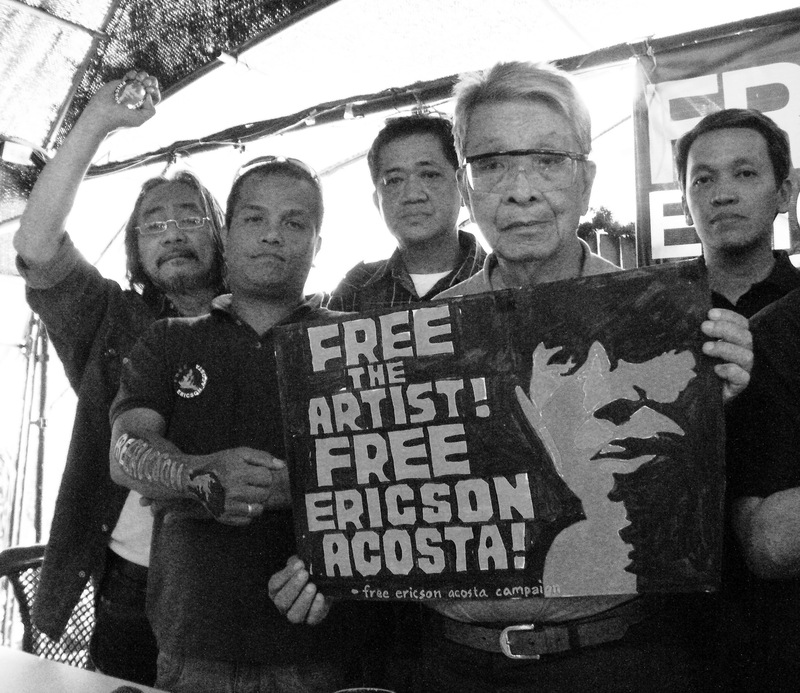 From a documenter of human rights violations , to a human rights victim himself, Ericson’s unjust detention serves as a challenge for all artists to get actively involved in the cause of civil liberties, genuine freedom and democracy. We are happy that fellow artists, writers and activists have thrown their full support behind his fight for freedom. Ericson is waging his own struggle behind bars. Every song, poem and statement from his detention facility is an assertion of his rights, and an indictment of the rotten system. Ericson will celebrate his birthday on May 27, likely still behind bars as he awaits the prosecutor’s decision on whether or not the case against him will be filed in court. A campaign has been launched for his immediate release. We plan to have a benefit gig for Ericson to coincide with his birthday. We stand firmly with Ericson during this difficult period of struggle. *From Monument to Masses was a progressive post-rock band based in the Bay Area during the last decade. The name of the band was meant to challenge the notion that great men, for whom monuments are built, are the real makers of history. For FMTM, it is the struggle of the masses which shape society and determine the course of history. Click image to view PDF file of Ericson Acosta’s counter-affidavit which was filed today, April 11, before the prosecutor in Calbayog City. 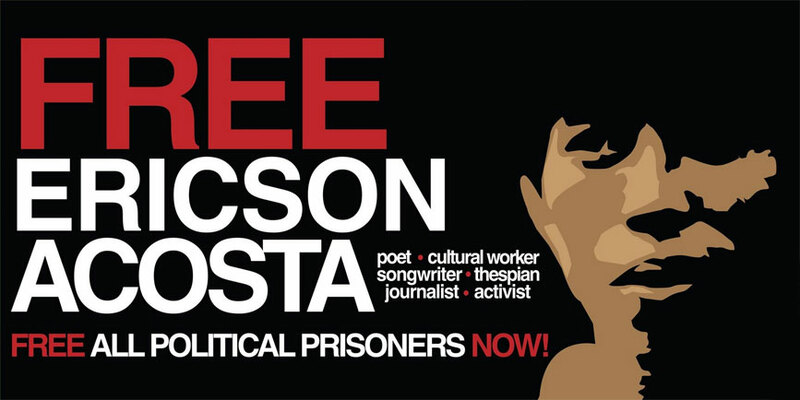 Cultural worker and activist Acosta continues to fight for his freedom against the trumped-up charges filed against him. In his counter-affidavit, he exposes the violations of his constitutional rights when he was arrested without warrant, subjected to prolonged interrogation, held by the military for 56 hours before being brought to the police. Acosta remains detained at the Calbayog sub-provincial jail. He is one of more than 300 political prisoners presently detained by the Philippine government. The Calbayog prosecutor, who is conducting a preliminary investigation, will now determine if the case will be filed in court. We stand with him in his fight for freedom. We stand for the protection of his rights and the dropping of the trumped-up charges. We stand with all political prisoners who are demanding immediate release. The Aquino government should probe a video showing what appears to be members of the Armed Forces of the Philippines training recruits to withstand supposed torture if they are captured by the enemy. The video was shows personnel purportedly from the 9th Infantry Division of the Philippine Army hitting recruits. The so-called training involves whipping the soldiers and other degrading treatment such as making them crawl in the mud. “The following video exposes various types of torture inflicted by the 9th IDPA Training Unit on the trainees. According to the upset soldiers who submitted the video, the extremely cruel exercises supposedly prepares the trainees in the eventualities that they will be captured by red fighters of the New People’s Army,” Isnayp says. The video certainly raises serious questions on the professionalism and conduct of the AFP. Are these training methods actually sanctioned by the AFP? Is this how recruits are prepared by the institution? Would not these methods also encourage soldiers to commit torture which is a serious human rights violation? Not only is the AFP institution rotten because of corruption. It is also rotten because it fails to observe human rights. It apparently inflicts violence even on its own personnel. It’s just sick. The AFP personnel in the video should be identified and made to explain their actions. The commanding general of the 9th ID as well as the head of the 9th ID’s training unit should also be investigated. The AFP should be teaching human rights and not torture methods. Patriotic elements within the AFP should come out and expose these cruel and degrading treatment of recruits, done in the name of “training”. These practices erode the professionalism of the AFP and encourages human rights abuses. The Aquino government should probe human rights issues in the AFP with the same fervor as corruption. To the younger generation of activists in UP, Ericson Acosta’s name would occasionally be mentioned as the composer of Alay Sining songs that remain popular among activist youth groups. To the 90’s generation of activists, Ericson was a campus journalist, poet, songwriter, and activist. He was Kultura section editor of the Philippine Collegian when I first met him in 1994. He wrote about the Eraserheads and Yano even before they were famous. Our meeting was somewhat of an accident since I hung out at the CNS library which was adjacent to the Kule office at the 4th floor of Vinzons Hall. Ericson was not part of any ND mass organization then. He was with the school paper and he had some activist friends. He was also with Amnesty International at the time. In the evening, we would jam at the 4th floor stairs along with other Kule staff and editors, singing our fare of Binky Lampano, Eraserheads and The Doors tunes. We would then move to the Grandstand at around 2am to sing some more to an unsuspecting audience at Sunken Garden. In the course of this interaction, Ericson would meet other activists from the UP Fine Arts and Alay Sining. He would eventually become chair of Alay Sining and would write, direct and act in the first original production of the organization, “Monumento”. It was a multi-media production on the life of Andres Bonifacio and the continuation of the unfinished revolution of 1896. We would collaborate on many of the early songs of Alay Sining, together with Babes, Len and Roselle. Ericson wrote a lot of songs despite not being able to play any instrument. He would write lyrics then compose tunes in his head. He would then ask someone to look for the chords of the songs as he sang them. Ericson was also involved in STAND UP in the late 90’s, becoming its chair during the early, difficult years of the alliance. It was during these challenging times that STAND UP sought to establish itself as the progressive alliance of students. This period paved the way for the eventual victories at the turn of the 21st century. He served the people even when he was no longer in UP. He remained a dedicated cultural worker and activist. He brought his talents and skills closer to the struggling masses. The most recent photo of Ericson while in military custody. Photo was issued by the AFP along with its press release. We got it through friends in the media. Last February 13, Ericson was arrested in San Jorge town in Samar, according to news reports. He remains detained in Western Samar and is accused of illegal possession of explosives according to one source in the military. The lone media report we have seen provides sketchy details as to the circumstances of his arrest. We do not know yet where exactly he is detained but there has been sufficient confirmation that he is being held. Human rights groups are now working to see him and provide whatever legal and medical assistance he may need. Media contacts quoting an AFP press release said that he was treated well during detention. Whatever the circumstances of his arrest may be, we his friends believe he is not a criminal and that he should be released. His safety must be assured and his human rights respected. LATEST UPDATES AS OF FEB.16, 930AM: Ericson is detained at the Samar sub-provincial jail, Calbayog City. HR groups are on the way to see him. I was able to attend the CHR public hearing on the November 15 Kananga incident which claimed the lives of top botanist Leonard Co and his two companions. The hearing was conducted at the Leyte Park Hotel in Tacloban City. Present at the hearing were the members of the 19th Infantry Battalion including the actual participants in the combat operations of November 15. Also there were the SOCO personnel who examined the incident site. I came to Tacloban together with the family of Leonard. His parents, wife, daughter and siblings traveled to Leyte to witness the hearing and hear from the military and the Energy Development Corporation what they all had to say about the incident. They were a family seeking justice. LinMay, the daughter said this was only her second plane ride. Her first was when they retrieved the body of her dad last Nov.15. Here’s what we’ve learned so far from the hearing. The SOCO team dispatched to the incident site reached the area some 24 hours after the actual incident. They say the site was already ‘contaminated’. The SOCO team merely “gathered evidence” but did not do an analysis of the site. They did not conduct a trajectory analysis of the bullet marks. They merely collected fired cartridge casings for ballistics tests. The SOCO team appeared to be either confused, ill-prepared or just plain ignorant of the correct investigative procedures. From their own testimonies, none of the members of the AFP units involved in the actual incident are aware of the existing security protocols between EDC and the AFP. That matter they say is taken up at the “battalion level”. If true, this is quite a scary situation. Soldiers on the field can very well have a “shoot now, ask questions later” attitude. One soldier was asked what he knew of the term “rules of engagement”. He could not answer. All the raw intel reports and information about so-called NPA movements were in the area of Cariraga, Leyte, some 18 kilometers away Northeast of Kananga where the incident happened. What were the soldiers doing in Kanganga? They were on their way to Carigara they say, based on a predetermined route, when their advanced scout saw the alleged ‘enemy’. The alleged ‘enemy’ sighted were three “men in black” who were allegedly armed. What were the “men in black” doing at the time the AFP unit saw them? Almost all of the soldiers who testified said the “men in black” seemed to be “observing something” in the forest. Hmm, observing something like, say, a scientist/botanist would do? If the “men in black” were NPA members, what could they have been observing? The AFP unit was able to observe the “men in black” for some 25-30 minutes while atop a ridge. This means the AFP had the higher ground, the element of surprise and therefore the tactical advantage. Yet the alleged NPA’s were able to fire the first shot. Lt. Odchimar denied that they ever had tactical advantage. The shooting happened for 10-15 minutes. More than 200 rounds were expended by the AFP unit. One soldier who carried a K-3 rifle shot 90 rounds during this period. In the 10-15 minutes they were shooting at the “men in black”, none of the targets were hit. When the soldiers conducted clearing operations at the area where the supposed targets were, they said they found nothing. The relative position of the soldiers, the alleged NPA and the EDC team of Leonard Co totally demolishes the “crossfire trajectory” theory of the DOJ-NBI. The alleged NPA were closer to the position of the military while the EDC team were described as being farther from the AFP position (malayo as one soldier described it). The EDC team was NOT in the middle of the AFP and alleged NPA. To further illustrate, imagine a triangle. The alleged NPA were to the relative north of the AFP unit, some 45 meters away, while the EDC team was farther northeast. For the alleged NPA to shoot the EDC team, they would have to be firing not in the direction of the AFP but in the direction of the EDC team. With the exception of Lt. Odchimar, none of the soldiers saw where the alleged NPA retreated to. However, all claim to have seen the 3 “men in black” and all claim to have seen the shots from the ‘enemy’. All soldiers say they could clearly see the armed ‘enemy’ and the color of their clothes. However, none of the soldiers could remember the color of the clothes of the civilian victims. While saying they could clearly see the enemy, it is also a mystery why not one NPA was shot, wounded and killed during the operation. Instead, we saw 3 dead civilians. There were two squads present during the operation. One squad was atop the ridge and engaged the ‘enemy’. The other squad remained at the lower side of the ridge and did not go up nor did they apparently engage the enemy. They were to be deployed as a possible blocking force? The shooting lasted for 10-15 minutes. It is untenable that during this period, the second squad of Lt. Perez did not join the firefight and provide suppressing fire towards the ‘enemy’. From the testimony, the second squad seemed to have no participation at all during the firefight. This claim is made even more untenable when Lt. Odchimar claims that there were probably 3-10 NPA’s at the area, based on the volume of return fire they received.The first squad that engaged the enemy only had 9 soldiers. If true, then the AFP certainly could have used additional troops during the shootout. The alleged non-participation of the second squad seemed to be the reason why only 9 firearms were submitted for ballistics tests. It is a mystery what the second squad was actually doing during the shootout.